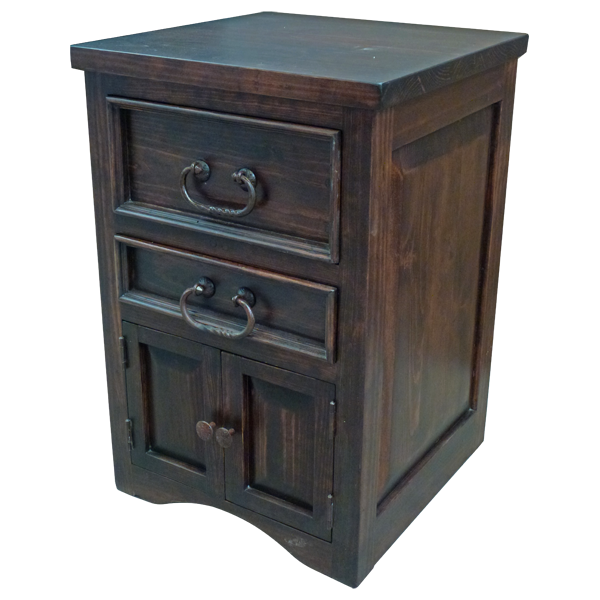 With its beautiful, dark, brown finish, this versatile, Spanish colonial style end table will complement your existing Western décor. The handcrafted end table has a wide top, and directly below the top are two practical drawers. The top drawer is large, and the second drawer is smaller. Both drawers are adorned with hand forged, iron handles. Above the base of the end table are two, small, cabinet doors with a cut, rectangular design, and each cabinet door has a hand forged, iron, pull ring on the side of each door. There is a decorative wood panel on each side, and the end table has ample inside storage space. Additionally, the end table is built with a curved base, and it is made with the best, sustainable, solid wood available. It is 100% customizable.